In the last few days I had more visitors than usual, so I had a look where they came from. Turns out that both the Pen Addict Podcast and Erasable linked to my blog, with more than 100 visitors coming from the Pen Addict Podcast and more than ten visitors coming from the Erasable Podcast. Thank you. Anyway, this blog post was supposed to be about something else: about the Label Roll I bought in my local Tesco homeplus for £4 (~$6.30; €5.60). Not cheap, 3M products never seem to be, at least not here in the UK, but they always seem to be useful and last a long time. 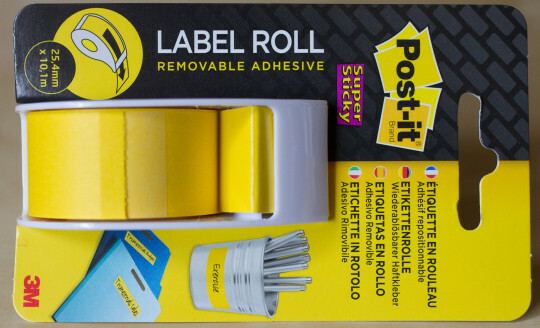 Post-its don’t seem suitable to label things, the glued area on the back is just too small and won’t last long enough – and their labels, which have the whole back glued, are even more expensive. One of the main advantages for me is that the labels are much bigger than what you get from a embosser / demo label maker, so it is easier to read on big items. So, despite the expensive price tag quite a nice new item of stationery. You might remember my blog post about stationery becoming more and more expensive …and my facebook post about the price of the Rotring Tikky. When I go to the supermarkets in Shanghai it’s usually E-Mart, a large Korean supermarket chain. In the past I used to go to Carrefour, but I think I haven’t been to a Carrefour in Shanghai for at least five years – just because it’s less convenient to go there. It’s a shame, because they always had a good selection of Faber-Castel products with very low prices. Even though I’ve seen Tesco in Shanghai1 in the past, I’ve never actually visited one. This had to change. I mentioned Tesco in previous blog posts. It’s one of the biggest or the biggest supermaerket chain in the UK. Many Brits try to avoid Tesco for various reasons, but my wife and I usually don’t mind and visit more or less all supermarket chains nearby, we don’t have a particular favourite. 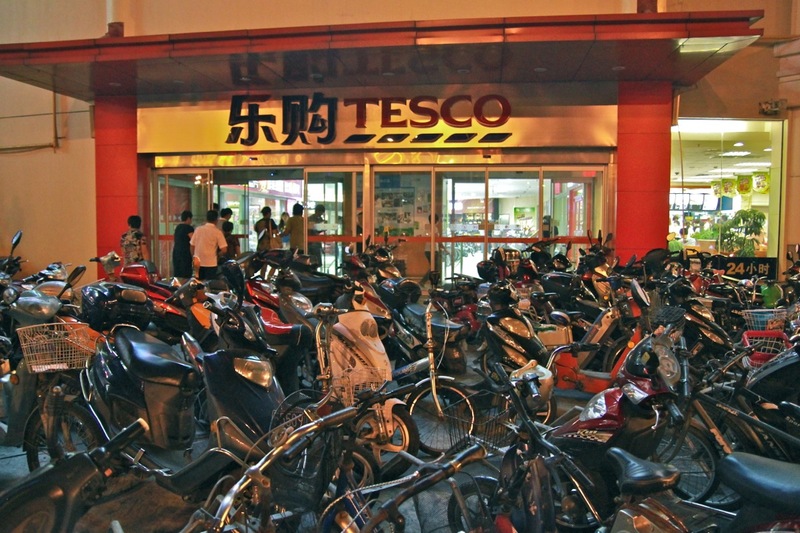 The Tesco I went to is in SongJiang, not far from the Shanghai Institute of Foreign Trade. 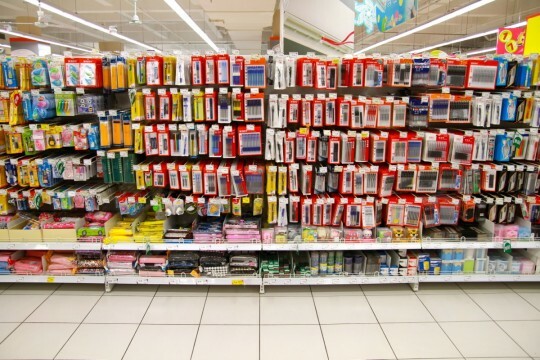 The selection of stationery is fantastic, much better than in the English Tesco extra I usually visit. 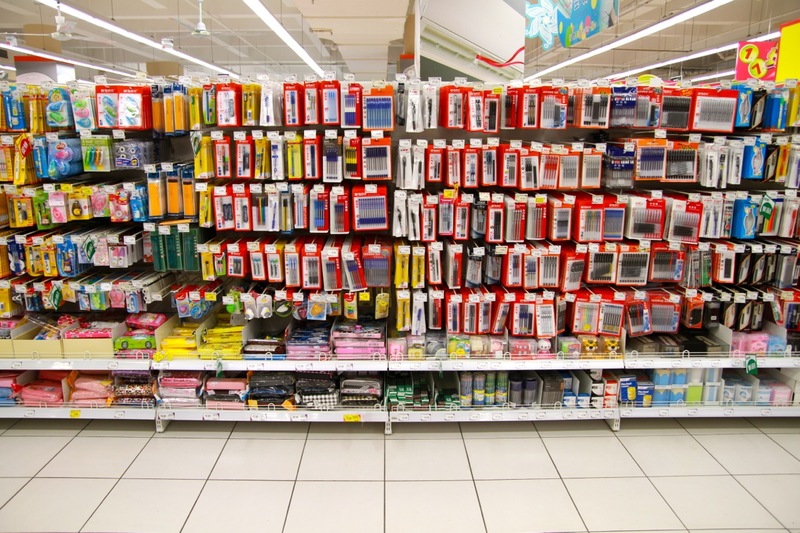 The stationery products on offer are dominated by Chinese brands, which is no surprise – there are a lot of Shanghainese M&G products in the shelves. Even though I did not notice this brand in the beginning of the decade, it has certainly been in all the supermarket chains in recent years. Pencil-wise the choice is not great, there are only a few different pencils to choose from. Most are hexagonal, some are triangular. Most space was reserved for Tesco’s own brand yellow pencils (I’ll try to check where they are made when I go there again), Staedtler’s yellow pencil 134 (produced in Shanghai) and Chung Hwa’s Drawing Pencil 101. Pens are surprisingly cheap, but I’ll write more about that another time. One brand that seems to grow year on year in China, Britain and Germany is Maped. Maped – Manufacture d’Articles de Précision Et de Dessin (Manufacture of Precision and Drawing Tools) is a French company established in 1947. Unlike companies like Staedtler or Faber-Castell, Maped concentrates more on non-pen stationery, like paper-clips, scissors, etc. Since 2006 they own Helit and Diplomat, two German companies. 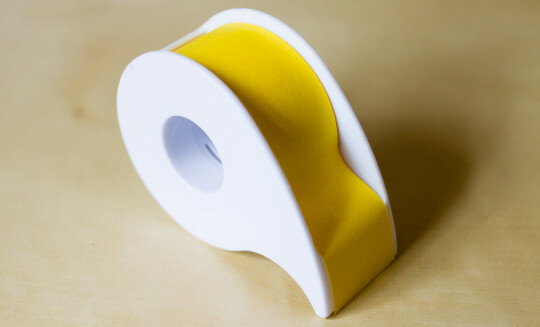 Helit manufactures Bakelite desk accessories and other items. You can see their Bakelite blotting roller in this blog post. This blotting roller is from a mould or based on a mould that is at least 90 years old. Back to Shanghai: I’m quite happy to have so much choice. You can be sure that I already bought quite a few stationery products in LeGou Tesco. I don’t want to give the impression that I am a big fan of Tesco’s. When we go shopping we also buy from the other supermarkets (except maybe ASDA) …but I just have to mention this offer as it might be of interest for those of you in the UK (there might also be a similar offer in Ireland). 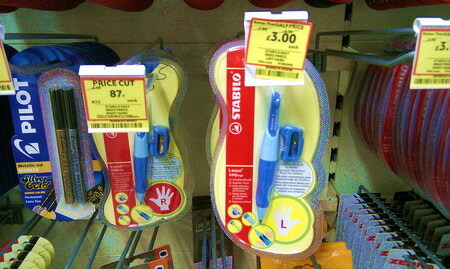 Tesco is currently selling the right handed version of the Stabilo EASYgraph double pack for 75p (~$1.17, 89c). The normal retail price is £2.70 (~$4.22, ~€3.23). The EASYgraph is designed for schoolchildren who learn to write. It has a triangular shape, is over-sized and its specialty is its design which includes grip moulds that are supposed to support the fingers in gripping the pencil easily. As the pencil gets shorter through sharpening the next grip moulds can be used until the pencil is used up. There is a clear layer of paint above the wood visible in the moulds to protect the, from dirt. There is also a name tag at the end of the pencil which emphasises that this is a pencil for school children and the wood is PEFC certified. 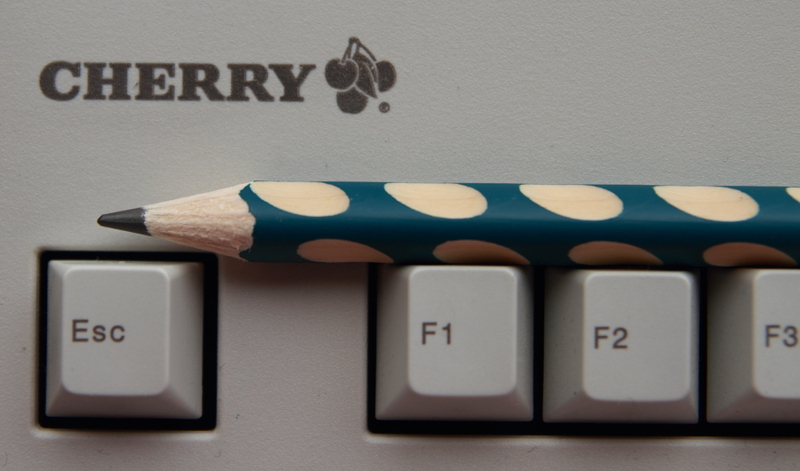 Altogether a very nice pencil, but it does feel a bit scratchy. After reading one of Sean’s recent articles I do however think that the sound this pencils makes might be responsible for the scratchy feeling. As far as I know the EASYgraph pencils are produced in Český Krumlov in Bohemia. In case you wonder about the keyboard in the photo: This is my favourite keyboard. The G80-3000LSC (click tactile) from Wisconsin’s Cherry Corporation. How does it fit into this article? They are both ‘writing instruments’ and they are both made in the Czech Republic. I would like to thank Lexikaliker for the Lamy plus pencil used in the photos. 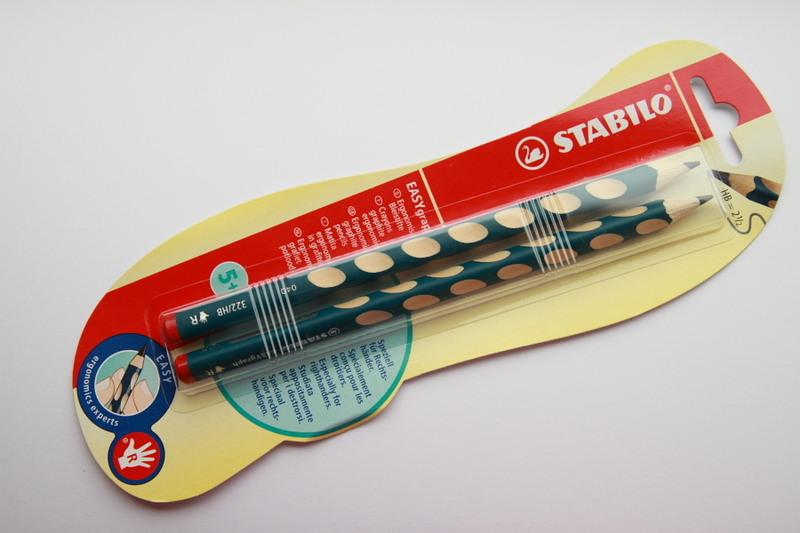 Dave has a review of Stabilo’s move easyergo mechanical pencil. A link to other posts at Bleistift that involve Tesco.